1. Why do I need a Reverse Osmosis Desalinator (Water-maker)? An on board Reverse Osmosis Desalinator (watermaker) is economical and saves the boat owner money in many respects. Boat wash downs with demineralized water leaves no spots, requiring no laborious drying time and protects rigging and hull. It saves thousands of dollars in rigging and hundreds of hours in labor. No more buying water, no more trip diversions to buy water, and no more bacterial and virus attacks. Water weighs 8.3 pounds per gallon. Storing minimal amounts of water and being able to make more as needed each day reduces the weight and draft of the boat, which saves fuel and allows more space for storage or fuel tanks to take longer voyages. 2. What capacity system is right for my boat? Why do I need so much water? The typical reverse osmosis desalinator is generally operated for part of the day, perhaps 4 to 6 hours. Fresh, pure water can be used for: laundry, drinking, showers, making ice, wash downs, and washing dishes. Divide the total gallon usage by the amount of hours the watermaker will be used. The resulting number is the gallon per hour rating of the required watermaker. i.e. : 190 gallons used per day divided by 5 hour operation would require a 38 gallon per hour watermaker or a 900 gallon per day watermaker. Marine watermakers range from 7 to 283 gallons per hour of operation (170 to 6,800 gallons per day) and commercial watermakers range up to 50,000 gallons per day. 3. Are there system differences? The Aqua Matic watermaker is the only fully automated marine desalinator available in the world! The Aqua Matic watermaker with one touch fully automatic operation is engineered with a user-friendly touch screen that displays pictorial images of all operating conditions. The system operating pressure automatically adjusts for varying feed water conditions without operator attention. System shut down may be set automatically for timed duration or the amount of product water produced. The Aqua Matic High Pressure Radial Axial Plunger Pump is engineered for 8,000 hours of operation before any maintenance is required. It is water lubricated, so no oil changes are necessary. The reliable Aqua Matic produces 450 to 1,800 U.S. gallons per day (1,703 to 6,814 liters per day) and is designed for frequent use in the typical pleasure craft from 40 to 150 feet in length (18 to 68 meters). This state-of-the-art desalinator is rugged and ideal for continuous operation on yachts and land and commercial installations. The Aqua Whisper DX watermaker is semi-automatic with a touch pad control panel. This workhorse conventional desalinator produces 450 to 1,800 U.S. gallons per day (1,703 to 6,814 liters per day) and designed for frequent use in the typical pleasure craft from 40 to 150 feet in length (18 to 68 meters). The Aqua Whisper Mini watermaker is semi-automatic with a touch pad control panel. The Aqua Mini High Pressure Plunger Pump is engineered for 2,000 hours of operation between required seal maintenance. This low volume watermaker produces 170 or 350 U.S. gallons per day (644 or 1,325 liters per day) and is ideal for small size pleasure craft under 45 feet in length (20 meters). The Ultra Whisper watermaker is one touch, fully automated and recovers energy. This low power consumption watermaker is designed for the smaller sail and power boat under 45 feet that either have only DC power available or a small AC generator less than 4 Kw in size. This desalinator is designed for small boat use and is not recommended for land installations. The Coral Sea watermaker is semi-automatic and engineered with a user-friendly LCD touch screen that displays pictorial images of all operating conditions. The commercial rated desalinator produces 2,800 to 6,800 U.S. gallons per day (10,599 to 25,741 liters per day) and is ideal for mega yachts, commercial boats, oil rigs, and land-based applications. 4. Are water makers noisy? The Seafari is 10 dB quieter than other brand watermakers. The Seafari Escape emits an unnoticeable hum. Sea Recovery watermakers are the quietest and smoothest running desalinators in the world. The fully automated Aqua Matic series utilizes a Quintiplex (five plunger) Radial Axial Plunger Pump that provides low noise level with pulsation and vibration free operation. The Aqua Whisper DX is 10 dB quieter than the other semi-automatic brands on the market. The Aqua Whisper Mini series produces a negligible hum. The Ultra Whisper series noise level is virtually not noticeable. 5. Can I operate a system in Brackish Water? Yes. Brackish water will not harm the Reverse Osmosis Membrane Element or System. The Seafari Escape will automatically adjust its pressure to operate in Brackish Water feed sources and produce the correct amount of product water. The Seafari’s pressure can be manually adjusted to allow normal operation in Brackish Water feed sources. The resulting product water will be of very high quality. 6. How do I flush (store) the Water-maker? Fresh water is required to “flush” or “store” the watermaker. This is done automatically with the optional Fresh Water Flush, which protects the Reverse Osmosis Membrane and system. Fresh water is required to flush or store the watermaker. The Sea Recovery automatic Fresh Water Flush assembly greatly prolongs the life of the reverse osmosis membrane elements by rinsing them with fresh water at the touch of a button. The fresh water flush automatically repeats itself every seven days. By rinsing the watermaker, salt water is displaced with fresh water within the R.O. system’s internal parts. This process will prevent corrosion of the internal parts and also reduces biological fouling of the membranes. The Fresh Water Flush is included free of charge with the Aqua Matic and Ultra Whisper and is also included in the Deluxe Filtration Upgrade package for other Sea Recovery series. 7. Do water-makers take up much space? We manufacture some of the smallest and most compact watermakers available. If there is insufficient room on your boat for our compact model, we also have modular systems that are designed for separate system component placement. 9. What is the life expectancy of the water-maker? The life expectancy of a watermaker is 20 years with proper maintenance. Like all power-driven equipment, following a routine maintenance schedule is highly important to provide superior mechanical protection for your reverse osmosis system. The harshness and diversity of the climate and seawater conditions have been taken into consideration when generating the owner’s maintenance timetable outlined in the owner’s manual. 10. What are the Power Consumption, Amperage Draw, and Power & Voltage requirements? The Seafari Escape is an Energy Recovery Reverse Osmosis Desalinator that draws about one ampere per gallon of water produced. The Seafari Escape is ideal for the smaller boat with no on-board AC generator. Each Series varies and are as efficient as possible. Refer to our brochure for specifications. The Soft Motor Starter option reduces A.C. starting load by 50% allowing for lower kw generators. Watermakers are available in any voltage configuration and power limitation. Generator Size (AC Systems) and Battery Bank (DC Systems) requirements vary depending on Model. Refer to brochure for specifications. The Sea Recovery reverse osmosis desalinators are designed to be as energy efficient as possible considering feed water flow and pressure requirements of the R.O. membrane element. Please refer to Sea Recovery’s marine brochure for detailed energy consumption data. The Soft Motor Starter option reduces AC starting load by 40% allowing for lower Kw generators to start the watermaker. Sea Recovery watermakers are available in any voltage configuration and power limitation. Generator Size (AC systems) and Battery Bank (DC systems) requirements vary depending on the model. Please refer to our brochure for specifications. 11. Is there an Automatic Shut Off with Full Water Tank or after a set time? Yes. A Tank Level Switch can be installed to automatically shut the system off. The Horizon Coral Sea Systems can also be programmed to shut down at a given point. Yes. The Sea Recovery Aqua Matic will automatically shut down and automatically perform a fresh water flush either with a user selectable time duration or product water production amount. Other Sea Recovery models are designed to receive a shut down signal from an external timer or water tank level switch. 12. Can the System be remotely operated? Yes. 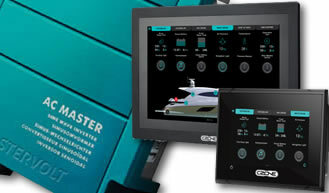 An optional Remote is available for one touch automatic operation from any location on the boat. 13. Can I operate the System in a Marina or Harbour? Yes. A conventional Reverse Osmosis Desalinator, such as the Seafari, can be operated in Marina or Harbor waters when equipped with an Oil Water Separator, which removes oil from the feed water; and with an Ultra Violet Sterilizer, which sterilizes the product water. Yes. Oily water will destroy the R.O. membrane element. However, Sea Recovery offers a free Oil Water Separator that removes oil from the feed water and protects the membrane element. A conventional reverse osmosis desalinator, such as our marine watermakers, can be operated in marina or harbor waters when equipped with the Sea Recovery Oil Water Separator which removes oil from the feed water and with an Ultra Violet Sterilizer which sterilizes the product water. 14. How long does it take to make fresh water? 15. How does R.O. work, and how does the ETD work? The R.O. Membrane rejects salt and allows the potable water to pass through. Refer to question #2: What is Reverse Osmosis? The Energy Transfer Device (ETD) in the Seafari Escape Series & Ultra Whisper recovers energy from the pressurized brine water and transfers that energy to the pressure chamber within the ETD. 16. What material is the Pump manufactured with? The HP Pump is manufactured of 316L Stainless Steel, Hastalloy, Duplex or higher depending on Series and Model. All are very compatible with seawater in Reverse Osmosis Desalinators. The Aqua Matic's state-of-the-art high-pressure radial axial plunger pump is manufactured with a highly corrosion and erosion resistant Duplex material, which provides greater protection than 316 SS (stainless steel). The Aqua Whisper DX and Aqua Whisper Mini high pressure pump are made from 316 stainless steel. 17. Are all R.O. Membranes alike? No. Our R.O. Membrane Elements are manufactured exclusively to more demanding requirements and higher specifications. Our membranes are Industrial Grade with High Flux (more water per square feet of membrane) and High Rejection (for higher product water quality). Our membranes produce more water in a shorter package for ease and greater versatility in installation. 18. Can you drink the water, and if so what does the water taste like? Yes, it’s delicious, low in minerals, softened, oxygenated, and the same temperature as the ocean water that is made from. 19. Can I use the water for my Batteries? No. Battery water requires distilled (0 PPM) water. Reverse Osmosis product water does contain small amounts of minerals, perfect for drinking and wash downs, not acceptable in a battery use. 20. Must I have a Genset to use a water maker? No. We have 12 & 24 VDC Systems available, as well as A.C. Systems that do require a generator. Installations? 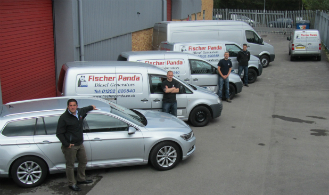 Extended 5 year world-wide warranty on marine installations carried out by Fischer Panda.